By consistently developing world class ride control products, KYB has become the worlds largest supplier of OE and aftermarket shocks and struts. Pit Stop USA sells all the products you need for your 3/4 and 1-ton GMC or Chevrolet Trucks including Shocks, Struts, Coil-Overs and Components. Pit Stop USA has all of your Street Performance needs including Ford Mustang (4th Gen) Shocks. Pit Stop USA is The Online High Performance Superstore! 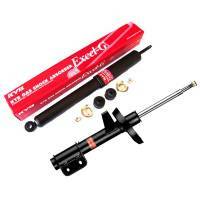 We feature KYB AGX Adjustable Gas Shocks at low everyday prices. Pit Stop USA is The Online High Performance Superstore! We feature KYB Excel-G Gas Shocks at low everyday prices. Pit Stop USA is The Online High Performance Superstore! We feature KYB Gas-a-Just Shocks at low everyday prices. Pit Stop USA has all of your Street Performance needs including Pontiac Firebird (1st Gen) Shocks, Struts, Coil-Overs and Components. Pit Stop USA has all of your Street Performance needs including Pontiac Firebird (4th Gen) Suspension. Check out the Recently Listed Shocks. Check out the Recently Listed Struts. $9.95 Flat Rate Shipping. Ships from Michigan. While much of KYBs overall sales are from automotive shock absorbers, we also produce a wide range of hydraulic and electronic equipment used in a variety of applications in many aspects of modern life. Vehicular and transportation applications include power steering systems, automotive electronics, construction equipment, agricultural equipment, special use vehicles, railroading, aircraft, and maritime shipping. KYBs North American manufacturing, marketing, sales, and distribution are managed by four subsidiaries in the United States and Mexico:KYB began as Kayaba Research Center, founded in Japan on November 19, 1919 by Shiro Kayaba. Having established itself in the manufacture of hydraulic dampers, the company became known as Kayaba Manufacturing Co., Ltd. in 1935. The company grew steadily, and in 1959, was listed on the Tokyo Stock Exchange. In 1974 a sales subsidiary was established in the United States. Today, that company is known as KYB Americas Corporation. In 2005, the brand name KYB was adopted as the official corporate name. A commitment to engineering innovation and manufacturing excellence has helped KYB to become the worlds largest supplier of shocks and struts for auto manufacturers and the aftermarket. Nearly one in every four autos built comes with KYB shocks and struts. KYB has manufacturing facilities in Japan, the United States, and Europe.